Butterflies are winged insects, that often have colorul patterns on tehir wings. Most butterfly species are diurnal. It is a common belief that butterflies have very short life spans, this may or may not be true, butterflies in their adult stage can live from a week to nearly a year depending on the species of butterfly. 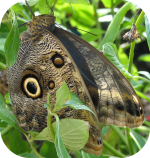 Habitat: Butterflies can be found in several different types of habitats. Common habitats with butterflies are: wetlands, meadows, wood's edge, rainforests, and gardens. Iconic Symbols: Butterflies are frequently used to represent the "soul". Butterflies are also used frequently in culture to represent freedom. Butterflies communicate mostly through chemical signals. Males produce 'pheromones' to attract females. A few species communicate with sound. China: In Chinese culture, two butterflies flying together symbolize love. Japan: Butterflies are viewed in Japan as the personification of a person's soul. One Japanese superstition says that if a butterfly enters your guestroom and perches behind the bamboo screen, the person whom you most love is coming to see you. However, large numbers of butterflies are viewed as bad omens. Greek: In Greek culture the butterfly is thought to represent the "soul" or "mind". Size: The largest butterfly species is the Queen Alexandra's Birdwing found in New Guinea, has a wing span of 11-1/8 inches. The smallest butterfly species, the Pygmy Blue Butterfly, is found in the Southern United States. The Pygmy Blue Butterfly has a wing span of only a 1/2 inch. Diet: Adult butterflies subsist on nectar from flowers, a few species feed on tree sap or rotting organic material. Arizona has more than 220 species of butterflies. 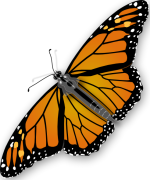 Description: Butterflies often have brilliant colors on their wings. The Butterfly's wings are covered with scales. Each scale is a single color, most of which are produced by pigments. The iridescence that is sometimes seen is produced from a reflective microstructure on the surface of the scales. Life Span: Adult butterflies can live as little as a week, or as long as a year depending on the species.